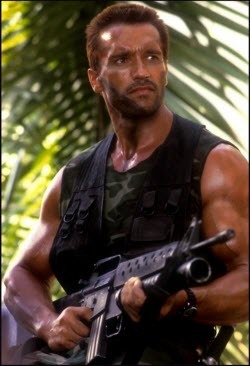 Unless you’re Arnold, furious bursts of action alone probably won’t get you very far. You need a plan for the action. This is especially important if you’re trying to get your business visible in local search – and particularly important if you want to boost your visibility in the ever-finicky Google Places results. That’s why I’ve sketched out a 12-week action plan you can follow to climb up a little higher on the local totem pole. This is a timetable that’s worked really well for me and my clients, though I recognize there’s more than one way to skin a cat (figuratively speaking, of course…I like cats). 12 weeks may sound like a long time. But I’ve found that’s about how long it takes to implement everything you need to implement – especially if you have a business to run and have your hands full. I always have a heck of a time trying to explain this verbally, but, as you can see, it’s actually pretty simple. What you’re doing – First editing your Google Places page to make sure all the info is accurate, and then claiming your page so any edits you made actually stick. This is also when you should try to remove any duplicate Places listings for your business, and it’s when you should do any basic optimization, like picking your business categories. Explanation of timing – It usually takes 7-12 days for Google to send you the postcard with the PIN that allows you to claim your Places page. Sometimes there are hang-ups, so it’s best to get started on this ASAP. Explanation of timing – What’s on your site has a huge influence on how you’ll rank in Google Places, especially in the ever-more-common “blended” local rankings. Therefore, if there’s even a chance you’re in trouble for keyword-spamminess, bad links, etc., you’ll want to start crawling out of the doghouse ASAP. Later on (like in weeks 5 & 9) is a good time to do some general housekeeping (like scanning for and fixing dead links), to see how you can beef up your pages with more service-relevant content, to put out a couple of blog posts, or maybe to do some link-building. What you’re doing – Listing your business on ExpressUpdateUSA and LocalEze, or – if you’re already listed there – making sure you’ve claimed those two listings. If possible, also claim your listing at MyBusinessListingManager and make sure it’s accurate. If you’ve got a few extra bucks, consider listing yourself on UBL.org. Explanation of timing – It generally takes about 2 months for these data-providers to feed your business info to Google Places and to third-party sites (CitySearch, SuperPages, etc.). Because your rankings really depend on how consistent your business info is from site to site, it’s important to deal with these sites at the very beginning. What you’re doing – Getting listed on as may directory sites as you can. Start with the most important sites (like all the ones you see when you do a GetListed.org scan) and eventually try to get on some of the sites nobody’s heard of (like some of the sites on my Definitive Citations List). If possible, also try to list your business on (1) “hyperlocal” sites that are specific to your city/town and on (2) directory sites that are focused on your industry (i.e., your “vertical”). You can find these citation sources with the help of the Local Citation Finder, or by doing it the old-fashioned way. Explanation of timing – You’ll be dealing with dozens of sites. Not only does it take time on your part to list yourself on them, but it also often takes weeks for these sites to list your business or process any edits you’ve made. You’ve got to start early. Plus, the more citations you can rack up over time, the better. What you’re doing – Checking the data-providers (see yellow) and at least some of your citation sources (see green) to make sure all your business info is 100% accurate – and fixing any inaccurate info you find. You should also check to make sure no duplicate Google Places listings have popped up – and remove any that have. Explanation of timing – Making sure your citations don’t get FUBAR is an ongoing task, but there’s no need to check on them every day, because many of them take a while to update. Just check on them every few weeks (at least during the 12 weeks). What you’re doing – Asking customers to write reviews directly on your Google Places page. As you probably know, they’ll need Google / Gmail accounts to do this. I suggest you ask about half your customers to write Google reviews, and ask the other half to write reviews through 3rd-party review sites (see below). Explanation of timing – If you haven’t claimed your Places page, or if your business has a bunch of duplicate Places pages floating around, it’s possible Google will erase your reviews. It’s best to hold off on requesting reviews until the Places pages aren’t being created, claimed, deleted, and otherwise jockeyed around. Plus, you’ll have your hands full anyway during the first couple of weeks. What you’re doing – Asking customers to write reviews on non­-Google sites. CitySearch, InsiderPages, JudysBook, etc. (and Yelp, but Yelp has rules against requesting reviews). I’ve found that having reviews on a variety of sites helps your Places rankings, and of course it’s a great way to attract the users of those sites. Explanation of timing – You can start asking for 3rd-party reviews even while your Places page is up in the air. But I suggest focusing on the other steps first – namely, having accurate and plentiful citations, a tuned-up website, and no duplicate Places pages. On the other hand, getting 3rd-party reviews is another ongoing task, which means it’s worth starting fairly early…hence why I say start around week 3. What if you’ve been wrangling with Google Places and local search in general for a while? I suggest you still follow the timeline. If one of the steps no longer applies to you – for example, if you’ve already submitted your info for the data-providers – then cross that one off and focus on the others. What if you already have a bunch of citations or reviews? Keep racking ‘em up. Sure, don’t pour as much time into them as you would if you were starting at Square One. But don’t stop at “good enough” – especially if you’re in a competitive market. How does this action plan stack up with yours? Leave a comment! This is a TRULY GREAT piece! Your plan looks pretty much the one I preach about, too – citations, citations, citations. Thanks for your compliments and for the great feedback (as always)! Yeah, weeks 5 and 9 are tough, but IMHO, week #1 is like the Navy SEALs’ Hell Week (minus the physical exertion…and guns…and sleep-deprivation…and swimming…). What a smashing comment – thanks, Jo! Nice Layout on the project plan. Emphasis is placed just the right areas requiring effort. Well done. Thanks, Dave! If there’s any way you think I can improve it even a little, I’d love to hear any suggestions you might have. Great graphic and super useful information. No problem, Daniella – thanks for the feedback! This is one awesome article Phil! My only critique would be that you superimpose your face over Arnold’s. That would make for one awesome photo! On a side note: That’s what I envision you look like when you’re providing me your signature “done for you service”. You’re the man! But…can you make my phone STOP ringing now? I can’t keep up! But seriously, the credit is yours for getting so many customers: you were doing an awesome job long before I came on board. Great advice and plan. What if you’re ranking well in the town you’re in but not surrounding towns. Good question. 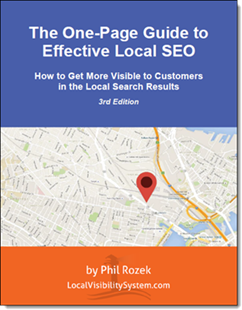 Whether you even *can* rank in towns outside yours just depends on a LOT of factors: how far away you are, how many local competitors you’re up against, which search terms you type in, which “Search near” location you’re using, how much organic juice your site has…and so on and so forth. I say you should still follow the same sequence. If it’s even possible for you to get visible in those farther-away towns (which, again, depends largely on the above), you may just have to push harder to get more citations, more reviews, more great content on your site (preferably stuff that wins you some good links), etc. It may take longer. But the basic steps and sequence would largely be the same. I like the use of colour bars to represent a specific task. It clearly lays out what needs to be done and it is easy to understand. Great article Phil! Hey Jackson, thanks for the feedback! I’m kind of a sucker for color-coding; this wasn’t my first post to feature it, and it certainly won’t be the last! “Spot On”, as my British friends would say. In addition I might mention the power of YouTube videos (properly done of course), social media initiatives, blogging, etc. It’ is a HUGE sphere that most small biz cannot embrace, while doing their jobs. Capital suggestion, Jim, old boy! I haven’t found that videos, blogging, and social media have much direct effect on local rankings, but they certainly can help in indirect ways. I definitely agree, though – so much so that I’d suggest those things to anyone, “local” business owner or not. Who you calling “old boy”? I prefer “mature”. In my experience, a few YouTube videos have significant and nearly immediate lifting effect on any biz, local or otherwise, provided they are geo-coded. And now with Google+ snippets integrated into search results, the social media impact on local search results will only increase. Once again, another great post Phil!! I love the project timeline chart! Thanks too for the link! No problem! Thanks for putting together such a nicely-detailed post. Will keep ‘em coming, all right! This was probably your most helpful article on getting my clients up to speed. Thanks! I think this is great. I personally think the citations should be over a longer period of time, there are so many to get it could take up to a year to get good ranking on all the factors of citations depending on the amount of keywords, keyword density, competition and towns! As far as Video SEO. I have been pushing SEO NJ in you tune for about 6 months. I am ranked #1 or #2 for that term. It works, but you have to be consistent once a week. Thanks for your compliments, and for weighing in! I totally agree that it’s smart to pursue citations long-term; in fact, I allude to that in the last paragraph. However, I just haven’t found that you need to spend *that* long working on citations. Sure, more is always better. And of course if you have an absolute data-consistency nightmare, it may take more than 12 weeks to get the main data-aggregators and citation sites to list your correct info – and to keep them that way. But I’ve just found that there’s a point of diminishing return with citations. Interesting about the videos. Those certainly are great if you can pull them off – especially if you’re in an industry where the 7-pack isn’t always triggered for your desired search terms. Darren Shaw pointed out this post to me. It’s terrific. How about doing an update to take + into account? I’ve been looking for a resource to share from anyone in Local who has documented how they research a new client’s existent presence, look for problems, get them going with places/+, in this new + era. Just a suggestion! Good call on the updated version for Google+Local. I will definitely do a 2.0 of this post (not to mention of the “how to pimp your Google page” post). Just waiting for the other shoe to fall – for Google to complete the transition to Google+. One thing I use to sniff out potential problems / challenges with clients is a short questionnaire. I send this to a potential client to determine whether, based on his/her responses, we even should work together. I know other local-searchers have questionnaires, and no doubt you have one that works every bit as well. Mine’s a work-in-progress! Great post as always Phil. While there is much I agree with, I am not convinced with the order of things. I could be wrong, but I have (and many before me) preached about sorting out citations first. Whether it be before activating your listing for the first time, or making any substantial edits. It has always been my understanding that, for example, when you activate your listing, Goog goes looking for supporting data. Should Goog not find said data, you stand to stunt your rankings. If Goog goes out and finds that you are a nobody; that you have nothing to back up your claim to fame (or rank) should they rank you well? However, should they go out and find all kinds of votes of confidence, including reviews, well I’d say Goog is going to look much more fondly upon you. I certainly won’t argue that you need to get that Google Local listing updated quickly…especially given that Goog takes a weeks to publish your changes. Whether or not the changes affect your rankings pre or only post publish is a whole other article. Not to say your order is wrong, but if it were me, I would get as much bloody supporting data live/correct first, including reviews before poking the bear. Thanks for weighing in! Very interesting take. I can see what you mean. To a large extent, the timeline is just what’s worked well for my clients and me so far. There certainly are other ways to go about it. I think your approach would be one possible way to start a local SEO campaign in any situation, but I’m guessing it would be most applicable to a brand-new business – one that’s never had a Google listing and that doesn’t have any third-party data floating around (yet). Businesses that have had some online presence – however unnoticeable – for more than a couple months tend to have some citations and third-party data that Google could look at. I’d be really interested in hearing more about the idea that you should get reviews before “poking the bear.” Do you mean Google+Local reviews, reviews on third-party sites, or both? I swear by it for new listings. How much more effective it is for existing, verified ones…hard to say. I meant third party reviews. When Google goes crawling for supporting data I want it to assign me as much clout as possible. It has been my experience that a local biz with reviews on it is better than one without during this process. I hadn’t thought much about Google reviews on say a un-verified listing…stack em up before verification…might be something there. Not sure. Keep in mind, I haven’t really done any conclusive testing on any of this. Purely based on experience, but have also heard similar findings from my peers. Gotcha. Thanks for the detail! I do generally find that older listings are a little easier to get good results for – and I think part of that is because (as you said) Google can draw on bits of info about that business floating around the local-search ecosystem. Anyone in particular who’s suggested the approach you mention (i.e. “peers”)? I’d be really interested in taking a look at any posts that describe it (to the extent there are any). Yes, older listings certainly are easier. I tend to compare older listings to aged domains. You’ll find it rings true on many levels. I don’t know of any posts in particular, nor can I remember whom I have heard it from. Though, I think if you ask around you will find most would agree or at least agree that it makes sense. I’d be interested in getting Nyago and the Professors thoughts on it come to think of it. Yeah, it would definitely be interesting to know others’ “action plans.” I believe Nyagoslav’s is similar to this one (see top comment on this post), but I’d also be interested in knowing The Professor’s take. Phil…great piece and I too got here via a link that Darren put up on our Canuck Skype group of SEOs…and yes, pls DO DO that Google+ update to the original post! Can’t wait to see it…. Just added your blog to my daily reading list too….there’s some pretty good tried & tested tactics here too, eh! If you’ve found my blog for the first time, welcome to the party! Thanks for your compliments. Is there a date for that post…. as it’s something I’d love to point some client’s “at” eh? Late to this post, but you got mentioned a few days ago in a David Mihm piece over at Mike’s blog. 1. Contemplate a change in name or address prior to all of this. Keywords in name. City center or city you care about for address. Move now if it makes sense. 3. Build up the website during that 12 weeks. You should do that anyway, but the better the website, the better the Google Places result. Great additions! As you say, the site definitely should be built up and beefed up constantly – not only during the 12 weeks. And a business owner should never, ever, ever stop drumming up reviews. I consider this action plan a baseline: the bare minimum someone has to do to be confident he/she is making progress. Great advice and info on improving local positions. Any extra advice for non-us followers (like us in Canada)? Thanks for the feedback, Carey. It’s pretty much the same process in Canada as it is here in the US. The citations up there are a little more straightforward and fewer overall, so although it’s still worth starting to hammer them out ASAP, it may not take you as many months to get listed (correctly) on all the important ones. I’d definitely get YellowPages.ca squared away as early as possible. I suggest referring Nyagoslav’s great list of Canadian citations throughout. Now that Google places is a mess with the Places/Google Plus integration, I wonder if this system still works. I’ve developed a process like this more or less and it seems to work pretty well. Yep, it still works great; I imagine your process still works well, too. None of the fundamentals has changed in the last year; the only changes have been in Google’s branding. Obviously, the rollout of Google+ is still not finished. Once the other shoe finally falls and all businesses have the same fully functional Google+ pages, I’ll do a 2.0 version of this post. Even then, the basic timeline will be pretty much the same. Just started using this 12-week action plan for one of my local targeted clients. I had a strategy similar to this, but mine was less refined. Great to hear. It’s just a rough sketch, so a similar plan should also work well. Could you comment on the value of Moz Local vs Express Update? Is one better? Total apples and oranges. But I will say that ExpressUpdate is just one site (albeit an important one), and being listed there isn’t enough. Just check out Moz Local.